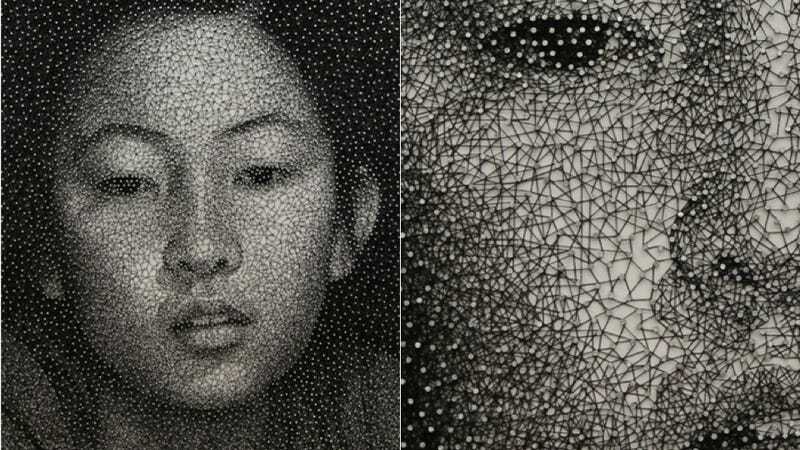 At first glance, these portraits (part of a series called "Constellation") by New York-based artist Kumi Yamashita might appear to be black and white photographs, or pen-and-ink drawings, but they are in fact made of materials far less germane to the fine art of portraiture. Using thousands of small galvanize nails studded into a wooden panel painted solid white, Yamashita works with one single unbroken piece of common sewing thread, winding it around and around nails, like a spider's web, to achieve an incredible shaded greyscale affect. In much the same way that shading is achieved with an ink pen by cross-hatching, the thread doubles back on itself to create denser and darker shades.